Indo-Caribbeans in the 19th century celebrating the Indian culture in West Indies through dance and music. From 1838 to 1917, over half a million Indians from the former British Raj or British India and Colonial India, were taken to thirteen mainland and island nations in the Caribbean as indentured workers to address the demand for sugar cane plantation labour following the abolition of slavery. Attempts at importing Portuguese, Chinese and others as indentured labourers had failed. A 19th-century lithograph by Theodore Bray showing workers harvesting sugarcane on a Caribbean plantation; on the right is the European overseer. Much like cotton, sugarcane plantations motivated large-scale near-enslavement and forced migrations in the 19th and early 20th century. Following the emancipation of slaves in 1833 in the United Kingdom, many liberated Africans left their former masters. This created an economic chaos for British owners of sugar-cane plantations in the Caribbean region, and elsewhere. The hard work in hot, humid farms required a regular, docile and low-waged labour force. The British looked for cheap labour. Since slavery had been abolished, the British crafted a new legal system of forced labour, which in many ways resembled enslavement. Instead of calling them slaves, they were called indentured labourers. Under this indentured labour scheme, Indians (primarily) began to replace enslaved Africans on sugarcane plantations across the British empire. The first ships carrying indentured labourers for sugarcane plantations left India in 1838 for the Caribbean region. In fact, the first two shiploads of Indians arrived in British Guiana (now Guyana) on May 5, 1838, on board the Whitby and Hesperus. These ships had sailed from Calcutta. In the early decades of the sugarcane-driven migrations, indentured Indians were treated as inhumanely as the enslaved Africans had been. They were confined to their estates and paid a pitiful salary. Any breach of contract brought automatic criminal penalties and imprisonment. Many of these were brought away from their homelands deceptively. Many from inland regions over a thousand kilometers from seaports were promised jobs, were not told the work they were being hired for, or that they would leave their homeland and communities. They were hustled aboard the waiting ships, unprepared for the long and arduous four-month sea journey. Charles Anderson, a special magistrate investigating these sugarcane plantations, wrote to the British Colonial Secretary declaring that with few exceptions, the indentured labourers are treated with great and unjust severity; plantation owners enforced work in sugarcane farms so harshly, that the decaying remains of immigrants were frequently discovered in sugarcane fields. If labourers protested and refused to work, they were not paid or fed: they simply starved. The sugarcane plantation-driven migrations led to ethnically significant presence of Indians in Caribbean. In some islands and countries, these Indo-Caribbean migrants now constitute a significant proportion of the population. Sugarcane plantations and citizens of Indian origin continue to thrive in countries such as Guyana, formerly, British Guiana, Jamaica, Trinidad and Tobago, Martinique, French Guiana, Guadeloupe, Grenada, St. Lucia, St. Vincent, St. Kitts, St. Croix, Suriname and Nevis. By some estimates, over 2.5 million people in the Caribbean are of Indian origin. Many have ethnically blended with migrants from other parts of the world, creating a unique syncretic culture. Though production was centered in the Caribbean, sugarcane production played a significant role in pre-World War II global politics and population movements. France, for example, negotiated with Britain leading to Act XLVI of 1860, whereby large numbers of Indian indentured labourers were brought for harsh sugarcane plantation work in French colonies in the Caribbean region. The Caribbean colonies of the Netherlands too benefitted from the indentured laborers from India. Indian indentured laborers worked for decades for meagre wages in sugar cane plantations of the Dutch East Indies. 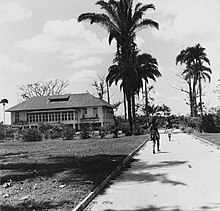 This image from Tropenmuseum Royal Tropical Institute shows two Indo-Caribbean people walking towards the house of a Dutch engineer in a Caribbean sugar cane plantation. 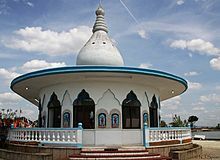 The majority of the Indians living in the English-speaking Caribbean came from eastern Uttar Pradesh and western Bihar which are mostly Hindi-speakers, while those brought to Guadeloupe and Martinique were largely from Andhra Pradesh and Tamil Nadu. About twenty percent (20%) of the indentured were Tamils and Telugus particularly in Trinidad and Tobago, and Guyana. Indo-Caribbeans comprise the largest ethnic group in Guyana and Trinidad and Tobago. They are the second largest group in Suriname, Jamaica, Grenada, Saint Vincent and the Grenadines, Saint Lucia, Martinique and Guadeloupe. There are also small communities in Anguilla, Antigua and Barbuda, The Bahamas, Barbados, Belize, French Guiana, Panama, Dominican Republic, Puerto Rico and the Netherlands Antilles. Small groups also exist in Haiti, where they are sometimes mistakenly referred to as "mulattos". Modern-day immigrants from India (mostly Sindhi merchants) are to be found on Saint-Martin / Sint Maarten, St. Thomas, Curaçao and other islands with duty-free commercial capabilities, where they are active in business. Other Indo-Caribbean people descend from later migrants, including Indian doctors, Gujarati businessmen and migrants from Kenya and Uganda. Indo-Caribbeans have migrated to the United States, Canada, Latin America (notably Panama, Colombia, Argentina, Peru, Brazil, and Venezuela), the Netherlands, France, and the United Kingdom, and to other parts of the Caribbean. Many Caribbean islands celebrate traditional Indian festivals, such as Diwali, as shown in this Divali Nagar decorations from Trinidad and Tobago. In 1995, Jamaica started to celebrate the arrival of Indians in Old Harbour Bay, St. Catherine Parish on May 13. In 2003, Martinique celebrated the 150th anniversary of Indian arrival. Guadeloupe did the same in 2004. These celebrations were not the fact of just the Indian minority, but the official recognition by the French and local authorities of their integration and their wide-scale contributions in various fields including agriculture, education, and politics, and to the diversification of the culture of the Creole peoples. Thus, the noted participation of the whole multi-ethnic population of the two islands were in these events. St. Lucia and many Caribbean countries have dedicated commemorative days to acknowledge the arrival and important contributions of their Indo-Caribbean populations. St. Lucia celebrates its Indo-Caribbean heritage on May 6. Other dates when India Arrival Day is celebrated in the Caribbean include May 5 (Guyana), May 10 (Jamaica), May 30 (Trinidad and Tobago), June 1 (St. Vincent), and June 5 (Suriname). ^ "Indo-Caribbean Times December 2007 - Kidnapping - Venezuela". Scribd. Retrieved 17 August 2018. ^ a b c "Forced Labour". The National Archives, Government of the United Kingdom. 2010. ^ a b "St. Lucia's Indian Arrival Day". Caribbean Repeating Islands. 2009. Wikimedia Commons has media related to Indian diaspora in the Caribbean. Jahajee Sisters: Empowering Indo-Caribbean Women - a movement-building organization, led by Indo-Caribbean women, committed to fighting gender-based violence and advocating for reproductive justice. Jahajee Sisters fosters solidarity and empowerment through dialogue, arts, leadership development and grassroots organizing. ^ Gupta, Bashabi (2011). "Indian Diaspora in the United States: Brain Drain or Gain?". Diaspora Studies. 5 (1): 139–154. ISSN 0973-9572. This page was last edited on 2 April 2019, at 19:37 (UTC).